The Scottish Ballet showed its artistic breadth and technical fortitude in a program of three diverse dances at the Joyce. It is Scotland's national company, begun in 1969, and is led by artistic director Christopher Hampson, who contributed Sinfonietta Giocosa to the program. This crisply structured neoclassical ballet, bookended by a tableau of two taut columns of dancers, is full of virtuosic leaps and turns. It's a work with great dynamic flair to match the music by Bohuslav Martinu. The highlight of the slate was its closer, Ten Poems, to said poetry by Dylan Thomas read on a recording by actor Richard Burton. It sounds somewhat dry at the outset, but Christopher Bruce's occasionally mimetic gestural movement ebbs and flows gracefully with the text's lyrical phrasing. He mines the emotion of the poetry without being too literal; rectitude might translate as upright posture and right-angled arms, childlike joy by jaunty, darting leaps. While there is no outright narrative, as each section is performed one or more new characters are introduced, culminating in a ensemble section. Marian Bruce designed the nostalgic streetwear costumes. Sophie Martin and Victor Zarallo in Bryan Arias' "Motion of Displacement." Photo by Andy Ross. Bryan Arias choreographed Motion of Displacement, a contemporary take on ballet that shows possible influences from Complexions and NDT, where he has danced; he currently is a member of Crystal Pite's Kidd Pivot. 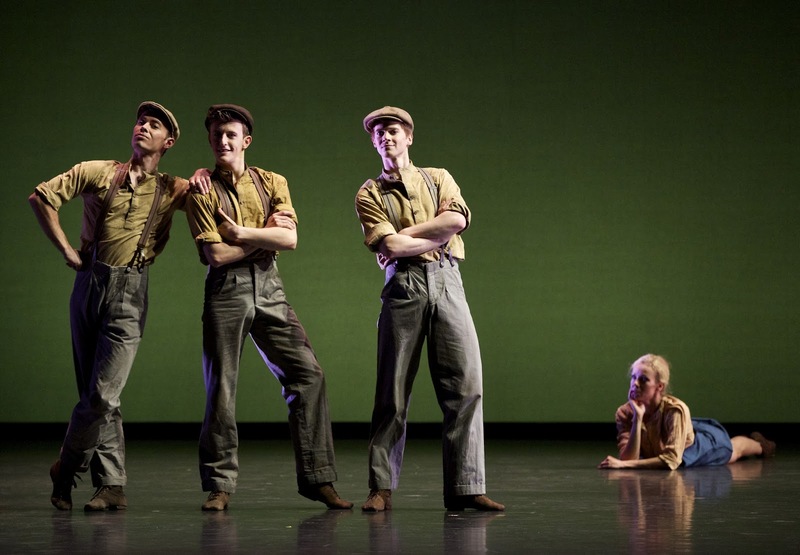 The dancers pose downstage, each in a varied shape but touching one another, and energy snakes through them. Shapes morph from curvilinear to angular, everything feels pushed and extruded, attenuated. A tall woman pairs with a shorter man; the rest watch, indifferently shifting their weight from leg to leg. Body parts are isolated, and they change levels from planks on the floor to strongly resisting gravity in pulled-up attitudes. They all start by wearing socks (thanks, Mr. Forsythe, who seems to be another influence); some women don toe shoes for duets. Arias also designed the handsome costumes: white tops with pale grey trousers, sometimes removed. While one can admire the strength and fluidity of the dancers, the piece, while full of style and formal ideas, felt emotionally bereft, particularly in light of Ten Poems.